Going to the grocery store? The bank? A medical appointment? For most of us, jumping in the car to head anywhere seems as natural as breathing in fresh air on a beautiful Central Texas day. But, what happens when things in your life change so that you can’t drive anymore? For Georgetown-area residents, Faith in Action Georgetown (FIAG) has an answer — the Senior Transportation program. Seeds of Strength granted $25,000 in May 2018 towards operating expenses for this wonderful program. On January 22, six SoS members accompanied SoS Liaison Gina Fought on a site visit to Faith in Action Georgetown to learn more. FIAG provides free transportation to individuals who are 65 years or older, have a Georgetown address, live independently or with family, are mobile without the use of a wheelchair, and not suffering from severe dementia. FIAG matches clients who need transportation with volunteer drivers who have decided to give back to the community by using their own cars for people who need rides. Though medical transportation is a common need, trips aren’t confined to medical purposes. In-town trips can be to grocery stores, other shopping, hair salons, the library or any number of places. Destinations for medical appointments can be in-town or range from downtown Austin up to Temple. And luckily there are volunteers who love to drive in those directions! FIAG also owns a very comfy van which makes weekly trips to the HEB on Highway 29 (Tuesdays), Walmart (Wednesdays) and the HEB on Williams Drive at DB Wood (Thursdays). Executive Director Vickie Orcutt kicked off the visit with an overview. FIAG was founded 18 years ago. She explained the size of the need. Currently in the US there are 10,000 people a day who turn 65; 26% of Georgetown’s population is 65+. Services are free, though many recipients choose to donate to FIAG. There are no income requirements to qualify for services. FIAG is not affiliated with any religious organization, but funding sources include contributions from partnering churches, civic groups, individuals and grants. Vickie’s welcoming staff took the SoS team through the organization’s end-to-end process including client intake, volunteer engagement, fundraising and development, and program coordination, culminating in a tour of the van and how routes are organized for its shared–ride model. In 2018, FIAG provided 10,773 rides, serving 788 clients — some regularly, some occasionally — with 350 volunteer drivers and the van. In addition to the gift of transportation, FIAG provides care calling/home visits, errand services, handyman services and a medical equipment closet. If someone calls looking for assistance on area aging resources and services, FIAG provides referral information — a great community resource. 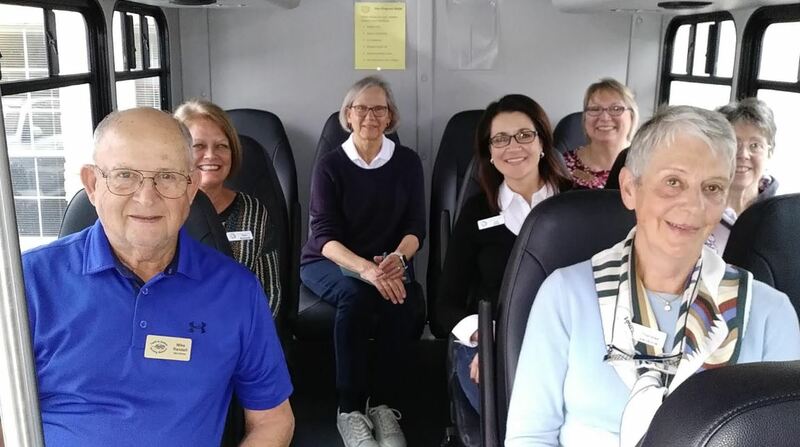 Besides the practical aspect of the transportation itself, providing rides means providing touch points for seniors who cannot drive, whether through the friendly interactions with volunteer drivers or on the van where the motto is: Shop. Share. Socialize. One client’s feedback summed up the importance of transportation to quality of life – because of FIAG, I have a full life, an individual life, in my own home. Want to learn more about who can use FIAG services? Want to volunteer? Give FIAG a call! (Note: Children are welcome to ride with their volunteer parent.) Faith in Action Georgetown’s 2019 focus for volunteer and client recruiting is Engage for Every Age. What a wonderful message for each one of us!